Alex Fattal’s research analyzes the central role that the media plays in Colombia's armed conflict through long-term ethnographic research. This combination of subject and method has led him to a research agenda that is deeply interdisciplinary, drawing on the social sciences, humanities, Latin American studies and the documentary arts. 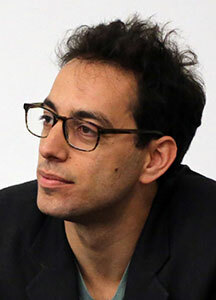 Subjects that he examines include: the shifting strategies, tactics, and practices of warfare in the twenty-first century, the corporatization of propaganda, critical studies of consumer culture and marketing, the politics of social media, and documentary filmmaking (especially in Latin America). Questions of temporality, surveillance, the role of the market in counterinsurgency, and the relationship between war and non-war are a few of the problems that motivate his research. Dr. Fattal is also documentarian whose practice exists at the intersection of experimental visual anthropology and social justice work. To learn more about his academic and creative work please visit these two sites where you can learn more about the two books and the feature-length documentary he is currently working on. His writing has been published by American Ethnologist, Anthropological Quarterly, Public Books, Sensate; and featured on the websites of Cultural Anthropology, the SSRC, Foreign Policy; and been quoted or highlighted by Wired, Washington Post, CNN, Los Angeles Times, among others, and he frequently blogs for Huffington Post. The National Science Foundation, the Social Science Research Council, the Wenner-Gren Foundation, the Swedish Institute; as well as institutional grants from Harvard University, where he completed his Ph.D. in anthropology and a Mellon postdoctoral fellowship, have funded his research. Should U.S. swap Iranian prisoners for Americans?